Sheikh Saad Al-Abdullah Al-Salim Al-Sabah, KCMG (Hon) (Arabic: سعد العبد الله السالم الصباح‎ Saʿd al-ʿAbd Allāh as-Sālim as-Sabāh) (1931 – 13 May 2008) was the Emir of Kuwait and Commander of the Military of Kuwait during a short reign of nine days (15 to 24 January 2006), succeeding Sheikh Jaber. Sheikh Saad was a general commander in the Military of Kuwait; in addition, the first to head the Kuwaiti Ministry of Interior until February 16 1978 and the first military officer to head the Ministry of Defense since 1964. Sheikh Saad, who was born in 1931, belonged to the Al-Salem branch of the Al-Sabah family and was eldest son of Abdullah Al-Salem Al-Sabah, who ruled Kuwait from 1950 to 1965. He had two younger paternal half-brothers; Sheikh Khalid and Sheikh Ali. His youngest brother Sheikh Ali Abdullah Al-Salem Al-Sabah is a governor. His mother was of East African origin. He attended the Mubarakiya school in Kuwait and Hendon Police College in north London. Sheikh Saad was a pillar and debuted his career as the first military officer to head the Kuwait Ministry of Interior and Kuwait Ministry of Defense since 1962 and 1964 respectively. He served as the general commander of the Directorate of Public Security Force and the Directorate of Police from 1961 to 1962. Consequently, he was appointed as the first Minister of Interior. With the forming the 3rd government on 6 December 1964; Sheikh Saad was appointed both minister of interior and defense simultaneously and held both posts until 1978. On February 16 1978, he became Crown Prince and held the post until July 13 2006. 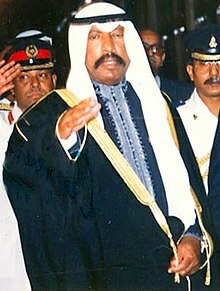 From February 1978 to July 2003, he also served as Prime Minister of Kuwait, after which that role was given to Sabah Al-Ahmad Al-Jaber Al-Sabah. A former flag officer of the Military of Kuwait, Sheikh Saad was the leader involved in liberating Kuwait from Saddam's regime. He refused to deal with any of Iraq's ministers or the heads of the Palestine Liberation Organization attempting to compromise the security of the country. During the exile of His Highness Jaber Al-Ahmad Al-Jaber Al-Sabah and his declaration of martial law; Sheikh Saad was appointed briefly as the military governor from 1991 to 1992. Sheikh Saad had suffered from colon disease, which led to speculation that he would refuse the Emirship. A declaration in November 2005 refuted such speculation, and Sheikh Saad took office as Emir on 15 January 2006 upon Sheikh Jaber's death. However, Sheikh Saad attended Jaber's funeral in a wheelchair, and his continued health problems caused some to question his ability to rule. He was also mentally ill. Some members of the Kuwaiti parliament expressed concern that Sheikh Saad would not be able to deliver the two-line oath of office, scheduled for 24 January 2006. On 23 January 2006, Sheikh Saad agreed to abdicate following a discussion within the ruling family, after only nine days on the throne. Although a new Emir had not yet been announced, it was evident that the position would be assumed by Sheikh Saad's second cousin and the late Sheikh Jaber's half-brother Sabah Al-Ahmad Al-Jaber Al-Sabah. On 24 January 2006, the Kuwaiti parliament voted Saad out of office, moments before an official letter of abdication was received. The Kuwait Cabinet nominated the Prime Minister Sheikh Sabah Al-Ahmad Al-Sabah to take over as Emir as expected. The college is in charge of training Kuwaiti Police members. It was established in 1969 and named after Sheikh Saad. Married to his cousin, Sheikha Latifa Fahad Al-Sabah, Sheikh Saad had five daughters, Maryam, Hessa, Jamayel, Sheikha and Fadya, and one son, Fahad. One of his daughters, Sheika, controlled international marketing at Kuwait Petroleum Corporation (KPC). Until late August 1998, she was the executive assistant managing director for international marketing at the body. Another daughter, Hessa, was elected as vice-president of the Arab-Italian chamber of commerce in October 2012. She is also the head of the Arab women's business council and representative of Kuwait in the Chamber's general assembly session. Sheikh Saad died on 13 May 2008, aged 78, at Shaab Palace in Kuwait City from a heart attack. Sovereign Grand Master of the Order of Mubarak the Great. Sovereign Grand Master of the Order of Kuwait. Sovereign Grand Master of the Order of National Defense. Sovereign Grand Master of the Military Duty Order. Honorary Knight Commander of the Order of St Michael and St George (KCMG – 12 February 1979). ^ a b c d Nonneman, Gerd (17 May 2008). "Sheikh Saad al-Abdullah al-Sabah". The Guardian. ^ "Kuwait in mourning for ex-leader, election campaign halted". Times of Oman. 25 May 2008. Retrieved 20 April 2013. ^ Moran, Dominic (3 July 2006). "Election deepens Kuwait's political crisis". ISN. Retrieved 20 April 2013. ^ "His Highness Sheikh Jaber III". The Telegraph. 16 January 2006. Retrieved 10 September 2014. ^ PM set to become new Kuwait emir; CNN, 24 January 2006. ^ a b "KPC Officials". APS Review Downstream Trends. 21 June 1999. Retrieved 20 April 2013. ^ a b Al Namir, Mahdi (5 October 2012). "Sheikha Hessa first Arab female Vice-Pres. of Arab-Italian Chamber of Commerce". Kuwait News Agency. Rome. Retrieved 20 April 2013. Wikimedia Commons has media related to Saad Al-Salim Al-Sabah.